I am quite picky when it comes to Mascara Wands and I often switch the brushes between formulas to make it work for me. For example, I absolutely love the brush with Rollerlash from Benefit, but I am not so keen on the formula, so what I do, is use the brush from Rollerlash in other mascaras to make them work for me. However, if you still haven't managed to solve this issue, then you need the L.A.B.2 Lash Out Loud Mascara Wands from beautyMART. To Lengthen - This is the orange/coral brush and it has a mixture of rounded spikes, and sharper spikes to encourage length. To Volumise - For this, the Yellow brush is in play and it has lots of long sharp spiky bristles on the sides as well as the tip. To Curl - The Pink brush is the one you need for this and it has lots of shorter spiked bristles with none on the tip. 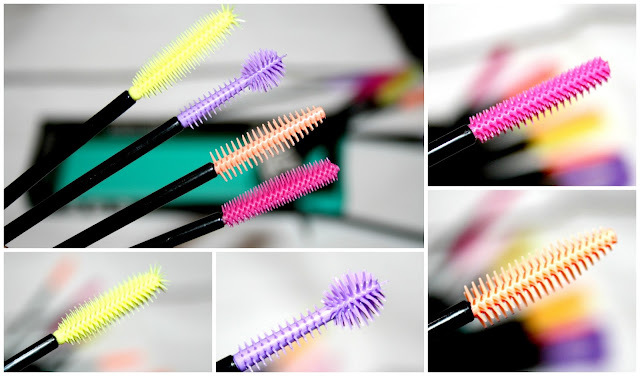 To Define - Last but no means least is the Purple brush which has lots of shorter spiked bristles similar to the Curl wand except it has a ‘ball’ shape at the end with longer bristles for catching the outer and smaller lashes. The wands are made from silicone and are reusable, you obviously just need to wash them. I find they are really handy for having in my makeup bag and desk drawer at work as well as for taking on holidays and weekends away. What's more, if you run out of spoolies for your eyebrows, then you can also use these brushes for a bit of an eyebrow groom too! For £5.50, I think these wands are great value for money. I really like that there are four different styles to work with and that there are three of each within the box, giving you chance to experiment and see which brush works best for you and your lashes. For me, it ultimately depends on my mood and I do switch between them, if the mascara formula I am using is quite a wet formula then it is either Pink or Purple to help separate the lashes that little bit more. I’d love to know what your favourite mascara wand type is? This is a great idea. I love the 'They're Real' formula but hate the brush. I always end up stabbing myself in the eye with it! Is it bad I just like them because they are colourful? This is such a good idea! It would stop me wasting mascaras because I don't like the brush! They are such a good idea! It is often I hate a mascara because of the wand but this is a great way to try different ones. That's a great idea actually, having a number of these wands for the type of effect you want! Do you know, I've never picked up disposable mascara wands before!! These sound so good though! These are so handy to have around and a great way to get the most from your mascaras too! These seem like such a fab idea! These look such a good idea a great way to try different types of wands! These look great and although they are supposedly disposable they are in fact reusable- so thats a bonus. These look so good! I must admit I am always playing 'musical mascara' and mixing up the brushes I like with the mascaras I like.